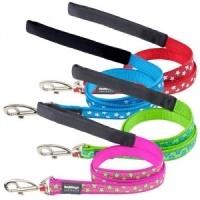 Quality adjustable dog collar and lead set by Red Dingo. A staple for any dog's collection. We love them because they are affordable yet durable and machine washable too. Perfect. This cute orange Desert Paws design is sure to be admired. 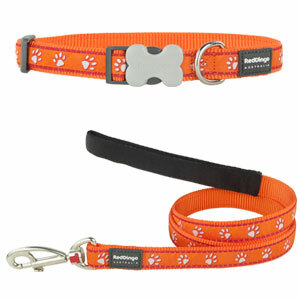 With these sets you get the matching collar and lead in size small, medium or large. Please see the collar sizes below. 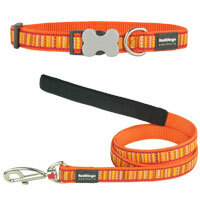 All leads have the same width as the collar and are all 4 foot in length. 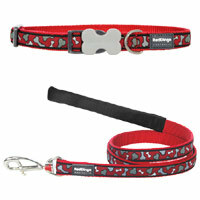 Red Dingo collars are made with premium high density nylon webbing and solid stainless steel D-rings. 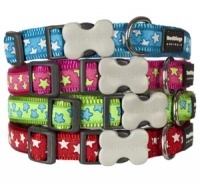 They are adjustable, making them ideal for all dogs including growing pups. They are extremely hard wearing and feature the unique acetal plastic 'Bucklebone' which provides quick release and easy fitting. It really adds a designer detail at a pocket pleasing price. The matching lead is strong, comfortable and equally stylish. Red Dingo leads are made from high density fray proof tough woven nylon for durability and reduced wear and tear. The padded handle ensures maximum comfort for you. Red Dingo is an Australian company who have put together a wide variety of dog accessories in patterns, designs and colours to suit every dog. All their products are strength and safety tested to the highest quality standard in manufacturing terms, embracing design without ever compromising functionality. The designs have an authentic Australian street and surf style.